Home » Will They Stay or Go? For decades, Canadians have been fed a steady diet of predictions, speculations and warnings about the baby boom effect—the ways in which the nation’s largest demographic cohort would shape our society in years to come. That future is now. With the first wave of boomers now classified as seniors, we are witnessing a dramatic shift in how and where Canadians choose to live out their retirement years. Current estimates predict that by 2036 nearly a quarter of the Canadian population will be over 65, compared with just over one-eighth in 2006. The spike in the population of those aged 80 years or more is even more significant, growing 112% between 2006 and 2031. This new generation of seniors is blessed with unprecedented health, vitality, education and wealth when compared to their ancestors. The lifestyle choices they make now will set the stage for how our homes, neighbourhoods, cities and suburbs are built in the future. In 2008, the Canadian Mortgage and Housing Corporation (CMHC) published Impacts of the Aging of the Canadian Population on Housing and Communities, a document highlighting its extensive research into this very topic. It reports some 85% of those over 55 said that they planned to remain in their present homes for as long as possible, even if there were changes in their health. 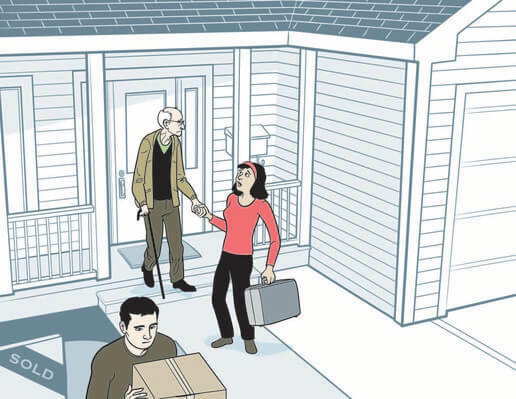 How and where seniors choose to live will have an impact on us all. If, as the CMHC reports, the majority remain in their current homes, new developments will be needed to accommodate increased demand for housing and provincial “Places to Grow” population estimates in targeted communities. In addition to a continued need for long-term care spaces, there has been a boom in the construction of specialized senior housing—lifestyle buildings and communities that offer a range of services, amenities and activities designed to attract the Zoomer generation under one roof. If a significant percentage of seniors choose this option, there will be a ready supply of re-sale homes on the market, limiting the need for new development. The ongoing struggle to limit urban boundaries while meeting the housing needs of growing populations is not new in Ontario. What is new is the extent to which aging baby boomers are being cited as a tool to support both sides. The Region of Waterloo is as familiar with the issue as any town in Ontario. With two universities, a college and a burgeoning high-tech sector, the area is expected to attract an additional 200,000 residents over the next 20 years. Region officials have prepared to meet this growth with an integrated light rail transit (LRT) project designed to limit urban growth, protect farmland and encourage urban intensification along the transit corridor. But what to do about housing? Waterloo’s Regional Official Plan called for a boundary beyond which no new development could take place. Based on its land budget calculations, Region officials proposed limiting the development of new land to 80 hectares and focusing on intensification and infill projects to meet the remaining demand. Citing CMHC statistics on seniors aging in place as one of the key factors, developers disagreed and argued that up to 1,053 acres of additional land should be opened up to development by 2031. In 2013, the OMB ruled on the issue, siding with the industry—a move that some claim undermines the authority of regional and city planners across the province. The matter is far from resolved; in the fall of 2014, Waterloo regional councillors voted unanimously to pursue a judicial review of the OMB decision. In the meantime, Waterloo continues to grow and prosper. Horne also points out that, while the Region presented details relating to seniors housing to the OMB as background information, its land budget calculation did not rely on analysis related to housing choices made by seniors. 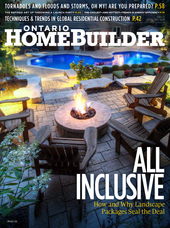 “Understanding the demands for housing is one of the biggest issues we face, and it is a controversial issue,” says Douglas Stewart, Senior Planner at Stantec Consulting Ltd. in Kitchener and chair of OHBA’s Land Development Committee. “We are striving to provide housing choice; it has to include each and every form—from ground-oriented single-detached to townhouse, to mid-rise, to high-rise, and from rental to owned. We all support infill and intensification, but it has to be balanced by making sure there is a sufficient variety of housing choices. “The planning framework has to be flexible to address the housing needs of today, as well as the short-, mid- and long-term needs,” emphasizes Stewart. “The Official Plans that determine urban boundaries are based on a 20-year planning horizon. Although legislated, the intent is to have the plans reviewed on a five-year cycle, but unfortunately that doesn’t always happen. “It’s important to understand not only the choices boomers will make, but also what housing demands will be made by immigrants. We tend to focus on generations—Baby Boomers, GenX, GenY, etc.—but I’m not sure there is enough documentation to understand and make housing decisions. We can hypothesize that seniors will stay in their homes or will move to other forms of housing for a variety of reasons, but I believe there is insufficient documented evidence and therefore this remains a hypothesis. When it comes to predicting the future residences of Ontario’s seniors, few are better positioned to make the call than the Schlegel-University of Waterloo Research Institute for Aging (RIA), a nine-year-old, not-for-profit organization whose Schlegel family benefactor has a lengthy history in senior-living and long-term care facilities in the region. Once the leap is made to a senior living facility, however, there should be flexibilty to accommodate the subsequent stages of the inevitable physical and mental decline. Sheri Maynard, Director of Marketing for Maxion Management Group, believes many boomers are choosing to make the move to purpose-built lifestyle communities earlier than in the past, allowing them to age in place more easily. “Aging in place does not necessarily mean staying in the same family home for their entire lifespan,” says Maynard. “For many seniors, it means staying in their own community, surrounded by the people and businesses they have built relationships with. “The baby boomers have very different expectations than previous generations. They are active, involved and used to a certain quality of life. They don’t plan on giving that up in retirement. Aging in place doesn’t have to mean struggling to maintain the family home or to access services, which can be a difficult, expensive and lonely proposition. While we have seen some great initiatives to help with healthcare, meals and physical renovations, they don’t necessarily address the social/emotional component of aging in place alone. “When seniors make the decision to move, it is usually based on health factors,” says Maynard, whose flexible options at The Uptown senior living residence in Waterloo allows buyers to sell their independent living unit and purchase a retirement suite without leaving The Uptown. While it’s clear that municipal and regional planners, developers and home builders must pay attention to trends and plan for the long term, Janet Kreda, a senior researcher with CMHC, cautions against giving too much weight to any one single factor, such as the aging boomer population. Kreda says the flexibility of housing stock will be key; as builders know all too well it is easier to plan and design for future adaptations rather than making modifications as an afterthought. For example, a second suite could be used throughout all stages of life: as accommodations for a nanny in the early years; for a teenager or young adult student; for a home-based business; to provide rental income; to accommodate the “boomerang” generation; and to house family members or a professional caregiver in later years. Liveable, walkable communities that offer public transit, a variety of housing options, services grouped together in close proximity and opportunities for social interaction will be key in meeting the needs of all citizens in the future, including the powerful baby boomers. Exactly what impact this demographic will have on our society as they continue to age is a bit of a mystery, though, according to Kreda.